Two months after the Hollywood pair shocked fans worldwide with a whirlwind engagement, they may have legally tied the knot. As one source told E! 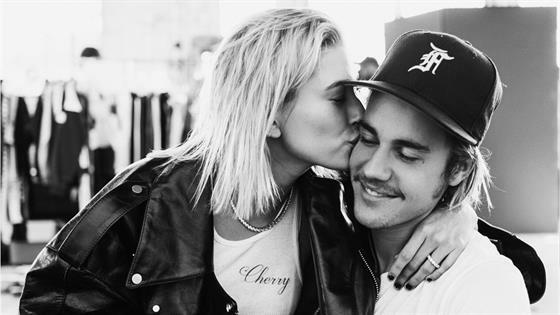 News on Friday, the 24-year-old pop star and 21-year-old model are legally married and are believed to have had a marriage ceremony at a New York City courthouse's marriage bureau to the surprise of everyone, including their own families. "They didn't tell anyone they were doing it," the source told E! News about the marriage. "They are doing a separate ceremony out of the country with a few family members soon as well." Meanwhile, Baldwin tweeted Friday that "despite the speculation" she isn't officially a Mrs.
As we all try to make sense of the breaking news, we can retrace the steps they took this week in the buildup to their secret ceremony. With New York Fashion Week in full swing, the model stepped out for the Carolina Herrera fashion show on Monday, where she sat front row alongside Lily Aldridge. Inside, Aldridge joked with E! News about creating Baldwin's wedding dress for when the time came. "I'm the designer," the expectant model quipped. "She's actually designing it for me," Baldwin echoed at the time. Baldwin also had Bieber on the brain when she explained to WWD why her fashion week schedule is not as packed. "I've tried to be really choosy with fashion week going forward, just because I want to have the time to spend being relaxed and being with family — and my fiancé." She also squeezed in some more gal pal time at the TommyXLewis Launch Party Monday night, where she posed for photos with Gigi Hadid. On Thursday, the same day the couple was reportedly spotted at a New York City courthouse's marriage bureau, Baldwin also popped up at a brunch event for bareMinerals. Meanwhile, after being spotted hanging out with Hailey's dad Stephen Baldwin in Grand Rapids over the weekend, the Biebs popped up on The Tonight Show on Thursday, where he and Jimmy Fallonwent incognito in New York City's Central Park. While disguised with dark sunglasses, fake mustaches and wigs, they roamed the park and performed a choreographed routine to the singer's hit, "What Do U Mean?" While it may have been a busy few days for these two, the week definitely ended on an unforgettable high note.